Hard edges come forward and blended edges recede. Artists for centuries have used the idea of hard and soft edges to create the illusion of three dimensional space. You can too! Edges also help define which areas of the painting are more important and which are less important. To easily blend an edge with acrylic paint, the paint on both sides of the edge should be wet. Take a brush or your finger and run it parallel with the edge and gradually work both sides of the paint into one another. Don't try to blend across the edge (perpendicular) because you will likely make a big mess. You can also use a figure-8 movement to blend the edges - this works better on a large edge. Voila, you have just made a beautiful blended edge! November 10-11 Art of the Carolinas, Raleigh, NC. For more information and registration Click Here. November 14-16 David M. Kessler Fine Art Studio, Winston-Salem, NC. For information and registration Click Here. 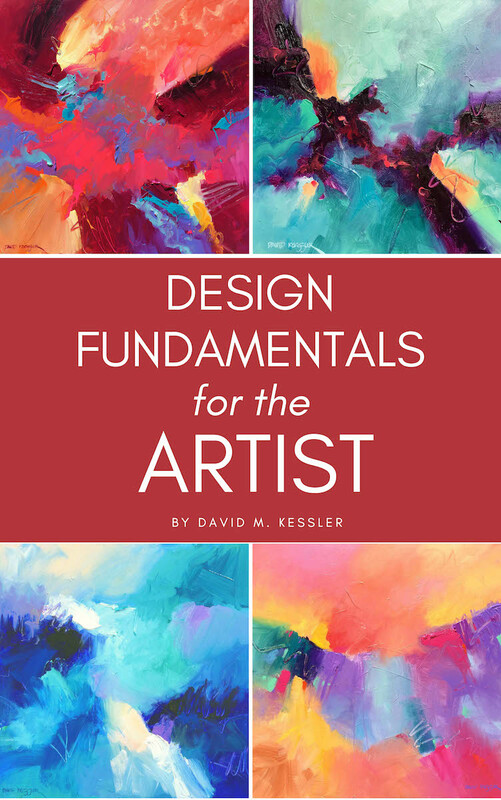 Design Fundamentals for the Artist will provide you with the fundamental knowledge you need to become a better painter. You can find out more by Clicking Here. Design Fundamentals for the Artist EBook. My Newest Ebook is filled with in-depth information on the five major Design Fundamentals of Shape, Value, Color, Edges and Center of Interest. Exact, practical, easy to understand instruction on how to implement each fundamental to make your paintings better than they have ever been.